High altitude rangeland and livelihood systems in Bhutan are undergoing changes in resource availability, population and user rights. This paper explores the existing governance structures of high altitude rangelands in Bhutan using Ostrom’s design principles as a framework for analysis. Qualitative interviews and focus group discussions were used to capture perceptions of 151 herders, sedentary livestock farmers and government officials across three case study sites. The research showed that most high altitude rangelands in the three case study sites have clear boundaries using natural and manmade landmarks along with a list of eligible users (design principle 1). Herders and livestock farmers have developed customary norms and rules to enforce and engender collective choice agreements for governance of high altitude rangeland (design principle 3). Community guards, appointed on rotational basis, guarded communal pastures against infringement (design principle 4). Herders and livestock farmers have developed graduated penalty system (design principle 5) and they were generally able to resolve most conflicts locally however some were resolved through district courts (design principle 6). However, rights to organize (design principle 7) and a nested enterprise approach (design principle 8) did not feature explicitly in local governance discourses and narratives. Incongruence between provision and appropriation activities under existing governance structures of high altitude rangeland in the case study sites, may be attributed to assignment of incomplete property rights (e.g. lack of management rights) in the bundle of rights. The research demonstrated assigning management rights in the bundle of rights and conformance to design principle 2 are inextricably linked, and vital for sustainable governance of high altitude rangeland. One way to institutionalize Ostrom’s design principles into natural resource governance is formalizing and codifying them in the form of a written group constitution and by-laws. The role of government policies, acts and laws that inform and constrain high altitude rangeland management are explored and changes suggested for improving the current governance system of high altitude rangeland in Bhutan. High altitude rangeland and livelihood systems in Bhutan are undergoing changes in resource availability, population and user rights. High altitude rangeland (known as tsa-drog in dzongkha the national language of Bhutan) is integral to yak herding and semi-nomadic yak herders’ livelihoods (Gyamtsho 2002). High altitude tsa-drog includes temperate, sub-alpine and alpine tsa-drog located between 2500 and 5500 meters above sea level (masl). In the Bhutanese context, tsa-drog may also include understorey of State forests which is used for grazing purposes only (Ura 2002). According to Derville and Bonnemaire (2010), high altitude tsa-drog support approximately 38,000 yaks belonging to 1000 herders’ households in 11 of the 20 districts. High altitude tsa-drog are located in remote/inaccessible areas where there are no motorable roads, grid electricity, potable drinking water and other basic civic amenities (Derville and Bonnemaire 2010). Tsa-drog degradation is a common problem facing yak rearing and livestock farming communities in different parts of the country (Dorji 1993; Gyamtso 1996; Gyaltshen et al. 2010). The degradation may be attributed to overgrazing, soil erosion, landslides and shrub encroachment (Dorji 1993; Gyamtsho 2002; Moktan et al. 2008). In addition, increases in human and livestock populations, family division of assets, climate change with significant rain events and abandonment of land are other plausible factors exacerbating this situation (Turkelboom and Wangchuk 2009; Gyeltshen et al. 2010). However, Gyamtsho (1996, 2002) argued that assigning incomplete tsa-drog property rights (e.g. without management rights) in the bundle of rights1 may lie at the heart of the tsa-drog degradation problem (Schlager and Ostrom 1992). This research has revealed the bundle of rights assigned to tsa-drog must include both appropriation rights to access and use (benefit from) the pastures and provisioning rights to manage and maintain (re-investment/costs) them for Ostrom’s (1990) design principle 2 (congruence between appropriation and provisioning and matching rules governing use of common goods to local needs and conditions) to be effective or the degradation problem occurs. The passing of the Land Act of Bhutan, (1979), and with it the annulment of individual tsa-drog ownership and reversion to State ownership, represented a watershed in the evolution of property rights of tsa-drog in Bhutan. Following the implementation of the Act only use rights (appropriation of benefits) were granted to tsa-drog users. However, provisioning (such as sowing pasture) and maintenance activities (such as burning, clearing or cutting of shrubs and brushes grown on tsa-drog) are not permitted (Gyaltshen 1996). Hence, conformance of tsa-drog governance structures prior to the introduction of the Land Act of 2007 to Ostrom design principle 2 is low. As a result, encroachment of high altitude tsa-drog by unpalatable tree species such as rhododendron and juniper species adversely impacts both pasture quality and quantity (Gyamtsho 2002). In order to address the above-mentioned weaknesses in tsa-drog governance arrangements under the former property rights regime, the Bhutan government introduced the new Land Act of 2007, to promote sustainable governance and incentivise yak herding. In this paper, we define sustainable governance as a process of allocating resources in a way that does not threaten the stability and resilience of either the system as a whole, or the key components of the system (Common and Perrings 1992). The Land Act of 2007 includes a nationalisation and leasing program, under which herders and livestock farmers will be permitted to grow improved pasture and implement maintenance activities hitherto not allowable. However, there is confusion and uncertainty among the herders and farmers as there are no clear mechanisms and guidelines for implementing the leasing program (Gyeltshen et al. 2010). This paper explores the governance structures of high altitude tsa-drog under the former property rights regime prior to the introduction of the new Land Act of 2007 in three case study sites in Bhutan using Ostrom’s design principles (DPs) as a framework for analysis. We used the following eight DPs from Ostrom’s (1990) DPs (see Table 1): DP 1 Define clear group boundaries, DP 2 congruence between appropriation and provisioning, DP 3 ensure that those affected by the rules can participate in modifying the rules, DP 4 develop a system, carried out by community members, for monitoring members’ behaviour. DP 5 use graduated sanctions for rule violators, DP 6 provide accessible, low-cost means for dispute resolution, DP 7 make sure the rule-making rights of community members are respected by outside authorities and DP 8 build responsibility for governing the common resource in nested tiers from the lowest level up to the entire interconnected system. Ostrom’s (1990) design principles (adapted from Ostrom 1990). Although some (Quinn et al. 2007) have argued Ostrom’s (1990) DPs are not a panacea or blue-print for successful common pool natural resources, they nevertheless encapsulate factors considered vital for sustainable governance outcomes under various socio-ecological settings. McGinnis (2011) argues the prospect of sustainable governance tends to increase when more of these principles are followed. Scholars such as Baggio et al. (2016), Quinn et al. (2007) and Le Tourneau and Beaufort (2017) have used Ostrom’s (1990) DPs as a framework for analysis of governance of common pool resources (CPRs) under different sociological and ecological settings. For instance, Baggio et al. (2016) found that DP 5 (graduated sanctions) and DP 2 (congruence between appropriation and provisioning) were the most important determinants of successful CPRs such as irrigation, fisheries and forestry, whilst their absence enhances the risk of CPR governance failure. Quinn et al. (2007) argued that DP 1 (clear boundaries) and DP 6 (conflict resolution) were of key importance in the governance of CPR such as rangelands in semi-arid regions in Tanzania. In their study of collective management of an Amazonian forest plot in north east Brazil by a group of rubber trappers, Le Tourneau and Beaufort (2017) concluded that individualised property rights arrangements might compromise collective governance initiatives (DP 3) and sustainability of a natural resource system. The latter authors also observed that DP 7 was critical for developing responsive natural resource governance structures tailored to local conditions. Although Baggio et al. (2016), Quinn et al. (2007) and Le Tourneau and Beaufort (2017) differed in terms of assigning importance of certain DPs in specific contexts, they all appeared to agree that DP 2 played a central role in promoting sustainable governance of CPRs. Our research reconfirmed and demonstrated the primacy of DP 2 in sustainable governance of high altitude tsa-drog. For instance, this research showed with concrete examples how the Bhutan government policy of granting only tsa-drog use rights to herders and livestock farmers without the management rights leads to suboptimal tsa-drog management (e.g. encroachment of tsa-drog by unpalatable tree species). Without the management rights in the bundle of rights, herders and livestock farmers are prevented from implementing provisioning activities which are vital for conformance to DP 2. Three case study sites located in three different districts/regions/areas in Bhutan were selected for this research (see Figure 1). The case study sites were selected to represent different high altitude tsa-drog management regimes found in Bhutan (see Table 2). Case study sites 1 and 3 are governed predominantly under the traditional management system, whereas improved pasture development under a new governance system (leasing) was trialled in the case study site 2. Case study site 1 is comprised of winter tsa-drog of herders from Merak gewog (or block is the lowest administrative unit in Bhutan equivalent to a local municipal council) under Tashigang Dzongkhag (district) in eastern Bhutan (see Figure 1). The winter tsa-drog is further divided into two sites: i) Cheabling and ii) Sheytemi. Cheabling (27°20′31.87″N; 91°45′44.67″E) is used by yaks and cattle belonging to 80 herders’ households (HHs). Similarly, Sheytemi (27°19′24.07″N; 91°44′23.38″E) is a winter tsa-drog of 14 herders’ households. Summary of case study site characteristics. Map showing high altitude rangelands in the three case study sites. Winter tsa-drog of Cheabling is under communal arrangement and has internal parcelisation but livestock are allowed to move freely without any restrictions. Herders have developed customary norms and rules such as imposition of strict entry-exit timing, penalty system and appointment of community stewards on a rotational basis. Any herder separating from their parents’ households automatically get rights by default to the communal tsa-drog. There were reports of historical and on-going disputes/conflicts over the use of tsa-drog between upstream yak herding (Cheabling and Sheytemi) and downstream livestock farming communities (Radhi, Phongmey and Chaling Shongphu) in case study site 1. Hence, collecting views and perceptions of downstream communities was considered essential to gain a complete understanding of the conflict situation. We define downstream communities as those communities residing directly downstream of the winter tsa-drog of semi-nomadic yak herding communities. Unlike Cheabling and Sheytemi under case study site 1, case study site 2 Sha Gogona and case study site 3 Chamgang (Dakarla) do not have downstream communities in their vicinity or on-going conflicts over tsa-drog and hence the need to include them in the present study was not required. In contrast, the winter tsa-drog of Sheytemi is under private use rights arrangement. Prior to the Land Act of 2007, more than two thirds of the winter tsa-drog in Sheytemi area belonged to an absentee landlady from which a group of ten herders rented and managed communally. Four herders, that is, two from Merak and the other two from the downstream community of Chaling Shongphu, claimed use rights to the remainder of that tsa-drog. Management norms and rules are similar to their counterparts from Cheabling. The membership of the tenant herder group has remained unchanged for decades. There are significant land degradation problems in Cheabling and Sheytemi such as gully formation, flash floods and landslides especially during rainy season. The second case study site is located at Sha Gogona (27°26′6.04″N; 90° 5′47.38″E) under Gangtey gewog under Wangdiphodrang Dzongkhag in the west-central region of Bhutan. In 2004, there were 30 households (three yak herding and 27 sedentary livestock farmers) (see Table 2). Prior to 2004, tsa-drog in Sha Gogona belonged to the local temple. Members of the community who use tsa-drog for grazing livestock had to pay rent in the form of butter and cheese to the local temple. This arrangement was discontinued following the introduction of the leasing program in 2004. Currently, herders and livestock farmers pay a lease fee to the government according to the rate prescribed in the Forestry and Conservation Act, 1995. However, to date, the government has not collected any lease fees. The absence of a formal lease signed between the herders/livestock farmers and the government may be a plausible explanation for non-collection of lease fee. The other plausible reason may be the non-completion of necessary formalities involved in sanctioning leasing program by the concerned line departments: Department of Livestock and Department of Forest and Park Services. Sedentary livestock farmers of Sha Gogona rear both local and improved cattle breeds such as Brown Swiss and Jersey crosses. In 2004, a pilot leasing program was introduced in Sha Gogona by the Bhutan government. Under this new governance arrangement, tsa-drog belonging to the local temple and empty (barren, non-forest) government reserve forest land (GRFL) in the area were pooled, demarcated using cadastral survey method and leased individually (2.5 ha per household) to members of a farmer group. All the households in the community are eligible to join the farmers’ group; however, two households voluntarily opted out of the pilot leasing program due to farm labour shortage and old age. Under the pilot leasing program, members received individual plots together with management rights to grow improved pasture which previously had not been allowed. Giving individual plots to individual members was expected to allow more direct control over the management of the plots that might result in incentivising investment and better management. For smooth day-to-day management, the community members drafted a group constitution and by-laws. The by-laws clearly stipulate what herders and livestock farmers can or cannot do on the plots. For instance, herders and farmers were required to fence individual plots at their own expense, and plant one acre of improved pasture annually over the next five years. Similarly, they are not allowed to build any permanent structures such as residential houses inside the lease plots or approach His Majesty the King for converting lease plots to private property with full alienability rights. Such provisions were incorporated mainly to discourage herders and livestock farmers from repeating the same mistakes which prompted the government to revoke lease rights of tsa-drog given in the late 1970s and early 1980s. Although herders and livestock farmers received individual plots, their actions are constrained by the group constitution and by-laws, thus exhibiting characteristics of a mixed property regime (having features of both private and communal property regimes). In terms of constraints and problems encountered while establishing improved pasture, members expressed concerns about weed problems especially carpet bentgrass (Agrotis stolonifera) and Rumex nepalenses which are undermining growth and the establishment of improved pasture. The main justification for selecting Sha Gogona as a case study site is because this area is the only place where the Bhutan government has trialled a new governance arrangement (leasing) on a group basis for promoting sustainable management of high altitude tsa-drog. The leasing of government reserve forest land for improved pasture development represents a significant shift in terms of the Bhutan government’s policy towards rearrangement of property rights and governance of high altitude tsa-drog. 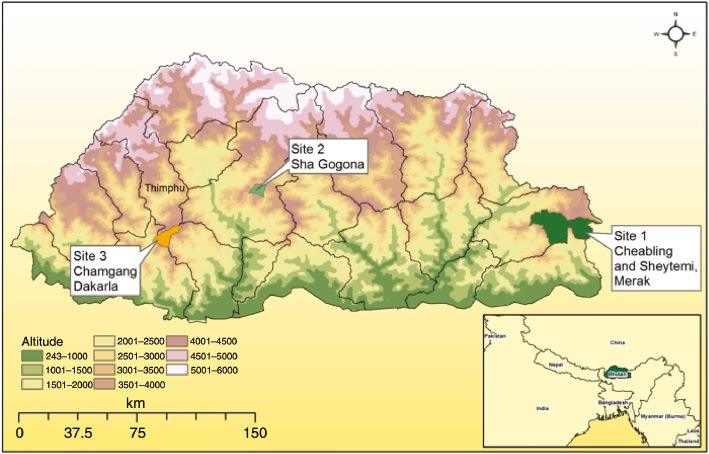 The third case study site is located at Chamgang (27°25′1.03″N; 89°42′13.70″E) under Dakarla gewog under Thimphu Dzongkhag in the western region of Bhutan (see Figure 1). Chamgang and surrounding areas serve as winter tsa-drog of yaks belonging to Wang-dro sub-group of 20 herders’ households (as of 2013) from Dakarla. Winter tsa-drog located in and around Chamgang area belong to herders, absentee landlords and dratsang (central monastic body). However, Chamgang is also the main permanent winter settlement area of herders of the entire Dakarla gewog. In the early 1990s, the Bhutan government granted government reserve forest land (GRFL) at Chamgang to the Dakarla herders to enable them to build permanent houses close to civic amenities and send their children to a local school. However, yak herds are located in remote and difficult to access areas situated far from Chamgang. In contrast to their counterparts in eastern Bhutan, there are fewer yak herders in Dakarla, but the latter have larger herd size and more extensive tsa-drog system. No landslides or flash floods were reported by these herders, but they noted that there is degradation of high altitude tsa-drog in this area. Degradation of tsa-drog is attributed mainly to overgrazing and encroachment of high altitude tsa-drog by unpalatable tree species such as dwarf rhododendrons and juniper species as reported by their counterparts in case study sites 1 and 2. The research adopted a qualitative research method to explore the perceptions of different stakeholders on sustainable governance of high altitude tsa-drog. In-depth interviews (n=40) and focus group discussions (n=9) were used to collect primary data. Purposive sampling method (Oliver and Jupp 2006) was used to identify potential interviewees. For ensuring internal validity of the study, the following measures were adopted: i) the same procedure and protocols were used to conduct semi-structured interviews and focus group discussions in all the three case study sites. For example, the first step was to conduct a public meeting at each case study site to brief the community on the aim of the research and voluntary nature of their participation; ii) to reduce selection bias, participants of the public meeting were requested to identify who they felt should be selected for the interviews and focus group discussions were based on that person’s knowledge of tsa-drog property rights, management rules and views on nationalisation. The communities decided who should and how many individuals should participate in the interviews and focus group discussions. The importance of including women participants was also emphasised, as women are often shy to come forward for interviews at the cost of introducing selection bias and iii) the same interview questions were administered in the same order to all interviewees by the same researcher. In addition, signing of informed consent forms and the voluntary nature of participation in the interviews and focus group discussion was explained to research participants. The participants were informed they could withdraw from the interview or focus group discussion at any stage without any fear of reprimand. Permission was sought to record the interviews and focus group discussions on a digital audio recorder. The qualitative data from the interviews and focus groups was coded by one researcher and as such is a study limitation. The herder’s household is the unit of interview and focus group discussion. In total, 40 in-depth interviews and nine focus group discussions involving 151 participants comprising herders, livestock farmers, downstream farmers and national, regional and district government officials were conducted to capture their lived experience and world views (see Table 3). The sample sizes for the semi-structured interviews and focus group discussions for each case study site are provided in Table 4. Sample sizes for the interviews and focus groups. Resource maps prepared by focus group participants served as a starting point for focus group discussions. Focus group discussions were mainly used to collect feedback and seek additional information and consensus among a wider audience on salient points highlighted in the semi-structured interviews. Interviews and focus group discussions were conducted in the local dialect. The interviews and focus group discussions were carried out between February and April 2013 and in April 2014. All interviews and focus group discussions were recorded with a digital recorder and translated into English and transcribed for analysis. Data analysis comprised three stages: i) coding, categorisation and thematisation (Charmaz and Bryant 2008); ii) cross-case analysis and consolidation (Yin 2008); and iii) conceptual or theoretical abstraction (Berg 2009). In the first stage of analysis, the interview and focus group discussion transcripts were systematically read and coded with the assistance of the computer assisted program NVivo (9 and 10 editions). Similar codes from both within and across cases were compared and linked to form categories and themes. The emerging categories and themes were aligned with the thematic areas from the semi-structured interview questions which provided the analytic scaffolding and guided the research analysis. The successive iteration of coding, categorisation and thematisation continued until saturation was reached (Dey 2007). However, it must be pointed out that only one coder was involved in coding and hence it is a limitation of the research design. Once the initial level of coding, categorisation and thematisation of interview and focus group discussion transcripts was completed, NVivo files were exported to Microsoft Word for further analysis and refinement. The NVivo program was too slow for word processing. In Microsoft Word, the hierarchy of table of contents/headings represented themes and categories identified using NVivo program. The iteration of the table of contents continued until it reached saturation (Bryman 2012). In the second stage of analysis, themes and categories from the three case study sites were compared and contrasted to identify points of convergence and divergence (Charmaz 2005). The presence or absence of design principles was deduced from the information provided on existing governance/management structures of high altitude tsa-drog in the three case study sites. The third stage of analysis involved theoretical reflections with the focus on reconstructing or re-enacting the ‘big or global’ picture based on the main empirical findings and conclusions from the research (Bryman 2012). The results from the analysis were compared with international literature on property rights (e.g. Schlager and Ostrom 1992) and natural resource governance (e.g. Ostrom 1990). The analysis of the three case studies yielded an in-depth understanding of the historical and contemporary context of existing high altitude tsa-drog governance mechanisms and institutions. This understanding was based on the lived experiences of herders and livestock farmers in their natural settings and how they are affected by their relationships with their physical and spatial setting (Berg 2009). Regarding the external validity of this study, the findings have applicability to other high altitude areas of Bhutan and elsewhere in the Himalayan region where yak rearing is practised under similar ecological and sociological conditions. The study findings provide some lessons learned for these areas and demonstrate the use of Ostrom’s DPs as a framework for analysis of rangeland governance. This research has demonstrated with empirical examples how property rights of high altitude tsa-drog without management rights resulted in non-conformance to Ostrom DP 2 undermining its long-term sustainability. The need to assign clear and complete property rights (i.e. with management rights) to ensure successful implementation of DPs, as shown by the findings of this research, may help inform rangeland governance arrangements elsewhere. To illustrate the differences between the three case study sites in relation to Ostrom’s (1990) design principles a summary table (see Table 5) is provided that shows the conformance of high altitude tsa-drog governance arrangements found in the three case study sites in relation to Ostrom’s (1990) design principles. Conformance of high altitude tsa-drog governance arrangements to Ostrom’s (1990) design principles in the three case study sites. The list of eligible users includes 80 herder households (as of 2013). A barbed wire boundary fencing erected in 2012 to prevent cattle encroachment from downstream communities. It used to belong to the local temple Natural landmarks are used as boundary markers. The list of eligible herders includes all the members of Sha Gogona community. The presence or absence of design principles was deduced from answers provided by herders and livestock farmers to thematic interview questions aimed at eliciting their views and perceptions of existing high altitude tsa-drog management and governance structures. The following section presents the results of the analysis of governance of high altitude tsa-drog in the three case study sites based on the interviews and focus group discussions. A discussion of each of Ostrom’s eight design principles in relation to the findings of the study is presented using qualitative quotes to illustrate the application of DPs in the context of high altitude tsa-drog. Since each individual plot is fenced and clearly demarcated, one can decide to grow, make hay or silage or let cattle browse on it as one wishes. It is better when it is done on individual basis. It is convenient. When property rights are not addressed, it becomes difficult to build mutual trust and cooperation. Clear policy, rights and use rights must be defined to bring about trust and cooperation (for collective action). ... The same tsa-drog which was sufficient for 20 heads of cattle can now carry only 9 or 10 heads of cattle. This is the difficulty. ...The environment then was in a very good condition. It has deteriorated over the years...is deteriorating further and further every year. In the past we had to lop and fetch fodder from the forest and we did not have land to grow improved pasture. Traditional winter fodder crops like radish and turnip were always in short supply. Now that we can grow improved pasture on the lease land, there is fodder for livestock. Ostrom’s (1990) DP 2 also advocates tailoring appropriation rules to local conditions to ensure sustainable governance of resources. In this research however, the ability of the herders and livestock farmers in Bhutan to develop appropriation rules suitable to local conditions was severely limited mainly due to lack of management rights in the bundle of rights. Ostrom’s (1990) DP 3 posits the prospect of adherence to governance rules and regulations is enhanced if people, who depend on the resource system for their livelihood, are directly involved in developing the rules and regulations. We found herders and livestock farmers in the three case study sites actively participated in the formulation of collective choice rules for successful governance of communal tsa-drog through a concept of mang. All registered households in a community or a village by default become members of a mang. Mang provides an interactive platform for herders and livestock farmers to discuss and reach collective choice arrangements and agreements. A tshogpa (community convener) is responsible for convening mang to conduct community meetings and to carry out repair and maintenance works on common pool resources such as village footpaths, drinking water supply, agriculture irrigation canals and local temples. The concept of mang relates to the concept of procedural fairness or procedural equity which advocates active participation in the decision-making process (DP 3) (Lind and Tyler 1988). Previously, tshogpa were appointed on a rotational basis among the households in the community and did not receive any emoluments. However, tshogpa’s household was exempt from community activities in lieu of his or her service. Since 2008, tshogpa are democratically elected to the gewog administration (local government) and receive emoluments. The tenure of tshogpa is for five years. The exit-entry timing is based on a kasho (an executive decree or an official communiqué or a fiat) issued by the then dungkhag (sub-district) administration... issued in the late seventies or early eighties. The kasho (fiat) says on the 15th day of the 5th Bhutanese month (May–June), animals leave for summer tsa-drog near Merak [...] and return on the 10th day of the 8th Bhutanese month (September–October). We stay here in Chubja (a hamlet in Sha Gogona) during winter. ...Once fodder gets exhausted there, we take our yaks to high mountains. One thing that has really benefitted the community is coming up with a group constitution and by-laws… it is always convenient to explain and justify that certain actions are done as per the provisions of the group constitution and by-laws. The current thrizin or chairperson of Sha Gogona farmers’ group reiterated that the group constitution and by-laws form the basis for maintaining discipline among the group members. We appoint community stewards to guard the communal tsa-drog against cattle encroachment […]. Each household contribute labour for guarding the main entrance and exit points on rotational basis. Those who do not have manpower to contribute labour, they contribute cash of Nu 100 (US $2.00 approx.) to Nu. 200 (US $4.00 approx.) per household). ...Risup has to report encroachment and levy and collect penalty. He has to keep an account of the number of animals involved, the defaulting households, and the area of tsa-drog destroyed or grazed. The yak herding group in Sha Gogona has no system of appointing community stewards. However, in the case of the pilot leasing program, an elected management committee is responsible for monitoring and enforcing provisions of the group constitution and by-laws. Here, the monitoring is a continuous process as opposed to their counterparts in Cheabling and Dakarla. In a similar manner, herders of Dakarla have developed an in-kind penalty system. In the case of the pilot leasing program in Sha Gogona, defaulters are penalised according to the penalty system in the group constitution and by-laws. Termination of membership and revoking of lease rights represent the ultimate penalty for defaulters. In contrast, the tenant herders of Sheytemi in case study site 1 need prior permission or consent of the absentee landlady before they can implement any activities on the rented tsa-drog. Ostrom’s (1990) DP 8 undergirds the concept of subsidiarity whereby authority is delegated to the smallest jurisdictional unit that is competent to make resource-related decisions and craft enduring solutions based on localised knowledge and norms. A nested arrangement affords flexibility and agility to mount prompt responses to emergency situations such as disputes or conflicts more effectively than larger institutions, which are often cumbersome and bureaucratic (Fennell 2011). As in the case of DP 7, DP 8 did not feature explicitly in the local governance narratives in this study although they were present to an extent in the existing governance arrangements. On the one hand, it is plausible that herders and livestock farmers consider DPs 7 and 8 as prescribed and given according to the existing government/community norms and rules, and which are sacrosanct and beyond negotiation. On the other hand, the existing Bhutan government administrative structures provide the necessary foundation for pursuing a nested enterprise for managing tsa-drog. The management of private use and communal tsa-drog are within the remit of gewog (block) administrative governance structure which is the lowest in the local governance administration hierarchy. For example, 280 households of Merak gewog are under Tashigang district and divided into different groups as per their tsa-drog rights and titles under the former property rights regime prior to the enactment of the Land Act of Bhutan, 2007 (Gup 2013 Personal Communication). Further, such groups may have internal parcelisation as in the case of communal tsa-drog of Cheabling. Similarly, in Sha Gogona under case study site 2, although a common set of group constitution and by-laws govern the government lease land for improved pasture development; individual members were given autonomy and authority to encourage investment in improved pasture development. The herders of Dakarla are also divided into two main sub-groups each comprising 19–20 herder households for easy governance and control. This research found DP 1 (clearly defined boundary); DP 3 (collective choice arrangement); DP 4 (monitoring); DP 5 (graduated sanction) and DP 6 (conflict resolution) were mostly present in the existing governance structures of high altitude tsa-drog in the three case study sites. On the other hand, DP 2 (congruence between appropriation and provision rules and location conditions) was largely absent from the case study sites 1 and 3 but it was present to some extent in the case of the pilot leasing program in Sha Gogona in the case study site 2. DP 7 (rights to organise) and DP 8 (nested enterprise) did not feature explicitly in the existing governance narratives of high altitude tsa-drog, although they were present to a limited extent in the existing governance arrangements. It is plausible herders and livestock farmers consider DPs 7 and 8 as “something already given; as prescribed within existing natural resource governance rules, laws and acts” and hence outside their influence or control. This may explain why DPs 7 and 8 did not feature explicitly in high altitude tsa-drog governance narratives and discourses. This research demonstrated with empirical examples that assignment of incomplete property rights (lack of management rights) in the bundle of rights (Schlager and Ostrom 1992) undermined conformance of governance structures of high altitude tsa-drog to DP 2. More specifically banning of provisioning and maintenance activities undermined the long-term sustainability of high altitude tsa-drog. In property rights’ literature, scholars (Bromley 1992; Demsetz 2002; Libecap 2009) reiterate that property rights have to be complete and well-defined regimes for effective natural resource governance. Quinn et al. (2007), Falk, Lohmann, and Azebaze (2016), Baggio et al. (2016) and Le Tourneau and Beaufort (2017) showed that conformance of natural resource governance arrangements to DP 2 is vital for ensuring sustainable governance of natural resources. “Congruence [to DP 2] seems to be the linchpin for success independent from the type of system” (Baggio et al. 2016, 431). Implicit in their observations is not only the need to balance appropriation (benefits), provisioning and maintenance activities (costs), but also it is important to tailor appropriation, provisioning and maintenance activities to local conditions (sociologies and ecologies) for sustainable governance of natural resources. Quinn et al. (2007) reasoned that DP 2 is more likely to be absent or weak in common property resources like pasture regimes. They posited this may be because rangeland management is based on traditional norms and rules which were not explicit or codified in law compared to, for example, inshore fishing. Moreover, it is difficult to partition pasture CPRs and the presence of multiple users may result in inadequate enforcement of communally defined rules and regulations. Inability of the local institutions to adequately respond or adapt to changes caused by socio-political instability, localised population growth and demand were cited as other probable reasons for poor adherence to DP 2 (Quinn et al. 2007). Similarly, Falk et al. (2016) based on their study of collective water provision in Central Namibia, observed norms underpinning congruence between provision and appropriation were more likely to be implicit than explicit in management regimes. For example, they demonstrated the existence of customary norms whereby livestock owners with higher livestock numbers made higher contributions (e.g. payment) to collective efforts, and reasoned that high transaction costs hindered formalisation of rules concerning congruence between provision and appropriation. According to Quinn et al. (2007), local rules for natural resource use are heavily influenced by national and district laws which are not always adequately attuned to local conditions and can further compromise adherence to DP 2 (Quinn et al. 2007). This research also demonstrated that power, authority and rights of natural resource users are informed and constrained by circumstances outside users’control. For example, restrictive and conservation-centric government policies, acts and laws may result in poor or incomplete assignment of rights (e.g. lack of management rights) which in turn may trigger a gradual process of high altitude tsa-drog degradation with adverse socio-economic and ecological impact. For example, encroachment of high altitude tsa-drog by unpalatable tree and plant species affect both pasture quality and quantity. The decrease in pasture availability, in turn, forced herders to resort to unsustainable practices such as: i) lopping fodder trees from nearby State forests to provide supplementary fodder for their livestock. This research has shown that this activity in Cheabling and Sheytemi in case study site 1 has become more frequent and indiscriminate as fodder resources dwindle coupled with rising demand for fodder due to increasing livestock and herder populations. Indiscriminate lopping of fodder trees together with the harvesting of timber for housing construction and firewood from the State forest has exacerbated forest degradation in Cheabling and Sheytemi in case study site 1. Loss of forest canopy (e.g. due to heavy and indiscriminate lopping) may result in increased runoff, flash floods and landslides as reported by the herders of Cheabling and Sheytemi. The situation may become worse if appropriate and timely remedial actions are not taken; ii) herders increasing their livestock herd size to compensate the loss in milk production due to decreased fodder quality and quantity. Each herder is driven more by necessity to maintain a certain herd production level to meet their basic subsistence and livelihood needs; iii) most herders and livestock farmers rent tsa-drog from other wealthy herders, absentee landlords or institutions such as monasteries and temples often under exploitative contractual terms and agreements (Gyeltshen et al. 2010). For instance, herders may often be coerced to look after livestock belonging to absentee landlords and institutions as a precondition for renting their tsa-drog and this may continue for generations, sometimes against their wish (Gyeltshen et al. 2010); and iv) some herders found it difficult to cope with winter fodder shortages and hence they sold their herds and stopped yak herding, threatening the continuity and loss of yak herding as a viable livelihood option. These findings resonate with those of Turkelboom and Wangchuk (2009) on land degradation assessment of eastern Bhutan. They found the poor quality of tsa-drog necessitated herders to access more natural resources and/or keep more livestock to produce the same amount of livestock product. They attributed decreased availability of fodder resources and tsa-drog degradation to: i) decrease in palatable grazing species and colonisation of unpalatable species, ii) strict forestry rules that restrict herders from clearing of bushes and shrubs on tsa-drog and iii) loss of tsa-drog due to landslides and gullies. As can be seen from the above-mentioned examples, tsa-drog degradation tends to increase proportionately where: i) natural resources are limited; ii) demographic pressure is high and iii) alternative livelihood opportunities are few, as in the case of Cheabling and Sheytemi. Similarly, Solomon, Snyman, and Smit (2007) in the case of Borona, Ethiopia observed that growth in human and animal populations was the main driver of rangeland degradation process. The lack of sustainable options may force herders to act unsustainably imperiling their own long-term livelihood and the health of the environment. For instance, it is plausible the long-term and intangible nature of conservation-related government programs and projects and under a resource scarcity situation, herders and livestock farmers tend to put livelihood imperatives and satisfying socio-economic interests before conservation. Lopping of fodder trees from the State forests by the herders of Cheabling and Sheytemi is a case in point. This finding resonates with Boyce’s (1994) view that poor people are willing to trade present benefits and costs for future benefits and costs. He pointed out that if the poor are themselves the principal victims of this environmental degradation, they grow steadily poorer in a vicious cycle. Devlin and Grafton (1998) argued until basic livelihood needs are met, citizens of developing countries such as Bhutan lack the ability to partake fully in activities designed to stop environmental degradation. Hence, it is important for government policies to harmonise short-term and direct livelihoods priorities with long-term and indirect biodiversity conservation goals for optimal natural resource governance outcome (Bunge-Vivier and Martínez-Ballesté 2017). The need for local priorities and needs to form the basis for a natural resource governance-related policy dialogue for greater social acceptance, relevance and legitimacy cannot be overstated. Legislations, acts and laws that are not attuned to local priorities and needs can be counterproductive socio-economically and ecologically as evidenced by the findings of this research. Both immediate subsistence (livelihoods) needs of herders/livestock farmers and the long-term conservation goals must be addressed concurrently for optimal natural resource governance outcomes. The research found that local norms and rules encoded in the form of written group constitutions and by-laws (as in case of Sha Gogona pilot leasing program) provide a better foundation for assigning natural resource governance rights and duties to members, compared to those which exist only verbally. Such rules and regulations embodied in a group constitution provide a socially legitimate and effective implementation and enforcement mechanism (German et al. 2010). The latter authors argued that development and official sanctioning of collective choice rules becomes easier by formalising by-laws and binds community members more firmly to their agreements (German et al. 2010). The inclusion of the management rights in the bundle of rights (e.g. leasing) as envisaged in the Land Act of Bhutan 2007 represents a major policy shift towards assigning more rights in the bundle of high altitude tsa-drog property rights. However, using property rights and DPs in tandem, rather than in isolation may be more effective in exploring natural resource governance structures. For instance, this research demonstrated that assignment of incomplete property rights (e.g. lack of management rights) may result in poor or nonconformance to DP 2 and may undermine the long-term sustainability of natural resources. Hence, assignment of complete and well-defined property rights is vital for sustainable natural resource management and governance. In particular, conferring management rights to allow herders and livestock farmers to implement provisioning and maintenance activities (DP 2) is vital to enhance sustainable management and governance of high altitude tsa-drog. The research also showed the weakness of DP 2 in the governance arrangements of high altitude tsa-drog in all the case study sites that may exert a stronger influence on the systems, than the combined strengths of other design principles. The research demonstrated that Ostrom’s (1990) DPs can be a useful analytical framework to explore the capacity of natural resource governance structures for sustainable governance. By using Ostrom’s DPs for analysing natural resource governance structures, this research provided insights into plausible linkages and interrelationships between property rights and DPs for sustainable natural resource governance. What rights natural resource users have over a natural resource are contingent on property rights entitlements granted to them by State. We posit property rights assigned to natural resources provide the overall framework for conformance to DPs or otherwise. For example, former property rights regime of tsa-drog prior to the introduction of the Land Act of 2007 grants only use rights and herders and livestock farmers are prevented from carrying out provisioning and maintenance activities undermining conformance of governance structures to DP 2. Hence, assigning well-defined property rights to natural resources is critical for successful implementation of DPs in natural resource governance. With the enactment of the Land Act of 2007, herders and livestock farmers will be granted management rights to implement provisioning and maintenance activities. The granting of management rights represents a major policy shift towards assigning more rights which augurs well for fostering sustainable high altitude tsa-drog management. Some potential implications of the research findings on the changes to policies and practices of governance of high altitude tsa-drog are: i) revoke or relax the ban on burning of high altitude tsa-drog, i.e allow prescribed burning under strict terms and conditions; ii) grant management rights in the bundle of rights to encourage provisioning and maintenance activities; iii) incorporate valuable lessons learned from the pilot leasing program trialled in Sha Gogona in the development of a practical implementation mechanism for scaling up and out the leasing program in 2018, as envisaged by the Land Act of Bhutan 2007; and iv) institute a more systematic inter-departmental and inter-agency co-ordination and consultation process to harmonise and rationalise natural resource governance related polices, acts and laws. Future research could explore the linkages and trade-offs between equity (social distributive justice), efficiency (economic viability and profitability) and sustainability (ecological resilience and integrity) goals and the type or types of natural resource governance institution(s) most suitable to tackle this troika. 1In this paper, a bundle of rights in the context of natural resource governance is defined as cumulative rights comprising access, withdrawal, management, exclusion and alienability rights (Schlager and Ostrom 1992; Poteete and Ostrom 2004; Ostrom 2008) (see also Honoré 1961). The authors are grateful to Charles Sturt University, Australia, for providing a research grant. They would like to thank officials from the Ministry of Agriculture and Forests and the yak herders and livestock farmers from Merak, Sha Gogona, and Dakarla for their kind support. We would also like to thank Sergio Villamayor-Tomás, Frank van Laerhoven and three anonymous reviewers for reviewing the manuscript and for their valuable comments and suggestions for improvement. Baggio, J, Barnett, A, Perez-Ibarra, I, Brady, U, Ratajczyk, E, Rollins, N, Rubiños, C, Shin, H, Yu, D and Aggarwal, R (2016). Explaining Success and Failure in the Commons: The Configural Nature of Ostrom’s Institutional Design Principles. International Journal of the Commons 10(2): 417–439. 10.18532/ijc.634. Berg, B. L (2009). Qualitative Research Methods for the Social Sciences. Long Beach., California, USA: Allyn and Bacon. Boyce, J. K (1994). Inequality as a Cause of Environmental Degradation. Ecological Economics 11(3): 169–178. 10.1016/0921-8009(94)90198-8. Bromley, D. W (1992). The Commons, Common Property and Environmental Policy. Environmental and Resource Economics 2(1): 1–17. 10.1007/bf00324686. Bryman, A (2012). Social Research Methods. 4th ed. New York: Oxford University Press. Bunge-Vivier, V and Martínez-Ballesté, A (2017). Factors that Influence the Success of Conservation Programs in Common Property Resources in Mexico. International Journal of the Commons 11(1): 487–507. Charmaz, K. C (2005). Grounded Theory: Methods for the 21st century. Handbook of Qualitative Research. Denzin, N and Lincoln, Y eds. London: Sage. Charmaz, K and Bryant, A (2008). Ground Theory Research: Methods and Practices. The Sage Handbook of Grounded Theory. Charmaz, K and Bryant. London, A eds. UK: Sage Publications. Common, M and Perrings, C (1992). Towards an Ecological Economics of Sustainability. Ecological Economics 6(1): 7–34. 10.1016/0921-8009(92)90036-R.
Demsetz, H (2002). Toward a Theory of Property Rights II: The Competition between Private and Collective Ownership. Journal of Legal Studies 31(2 II): S653–S672. 10.1086/342028. Derville, M and Bonnemaire, J (2010). Marginalisation of Yak Herders in Bhutan: Can Public Policy Generate New Stabilities that can Support the Transformation of their Skills and Organisations? Innovation and Sustainable Development in Agriculture and Food, Montpellier, 28–1 July, 2010, https://hal.archives-ouvertes.fr/4 hal-00522045; accessed on 05 May 2015. Devlin, R. A and Grafton, R. Q (1998). Economic Rights and Environmental Wrongs: Property Rights for the Common Good. Birmingham, UK: CW Henderson Publisher. Dey, I (2007). Grounding Categories. In: The Sage Handbook of Grounded Theory. Bryant, A and Charmaz, K eds. : 623.Los Angeles, London, New Delhi, Singapore: Sage Publications. Dorji, J (1993). Livestock Development and Pasture Management. Thimphu: Animal Husbandry Department, Ministry of Agriculture. Falk, T, Lohmann, D and Azebaze, N (2016). Congruence of Appropriation and Provision in Collective Water Provision in Central Namibia. International Journal of the Commons 10(1): 71–118. 10.18352/ijc.583. Fennell, L. A (2011). Ostrom’s Law: Property Rights in the Commons. International Journal of the Commons 5(1): 9–27. German, L. A, Mazengia, W, Taye, H, Tsegaye, M, Ayele, S, Charamila, S and Wickama, J (2010). Minimizing the Livelihood Trade-Offs of Natural Resource Management in the Eastern African Highlands: Policy Implications of a Project in “Creative Governance”. Human Ecology 38: 31–47. Gyaltsen, T (1996). Rangeland and Livestock Management in Bhutan. Rome, Italy: Food and Agriculture Organization of the United Nations. http/www.fao.org/ag/agp/agpc/doc/Publicat/TAPAFON/TAP_11.PDF accessed on 24 July 2017. Gyamtsho, P (1996). Assessment of the Condition and Potential for Improvement of High Altitude Rangelands of Bhutan. Zurich: Research, Swiss Federal Institute of Technology. https://doi.org/10.3929/ethz-a-00161083; accessed on 24 July 2017. Gyamtsho, P (2002). Condition and Potential for Improvement of High Altitude Rangelands. Journal of Bhutan Studies, Centre for Bhutan Studies, Thimphu, Bhutan 7: 82–98. Gyeltshen, T, Tshering, N, Tsering, K and Dorji, S (2010). Implication of Legislative Reform under the Land Act of Bhutan, 2007: A Case Study on Nationalization of Tsamdrog and Sokshing and its Associated Socioenomic and Enviornmental Consequences. Thimphu: Watershed Management Division, Department of Forest and Park Services. Honoré, A. M (1961). Ownership. Oxford Essays in Jurisprudence 107: 107–147. Le Tourneau, F. M and Beaufort, B (2017). Exploring the Boundaries of Individual and Collective Land use Management: Institutional Arrangements in the PAE Chico Mendes (Acre, Brazil). International Journal of the Commons 11(1): 70–96. 10.18532/ijc.589. Libecap, G. D (2009). The Tragedy of the Commons: Property Rights and Markets as Solutions to Resource and Environmental Problems. Australian Journal of Agricultural and Resource Economics 53(1): 129–144. 10.1111/j.1467-8489.2007.00425.x. Lind, A.E and Tyler, T. R (1988). The Social Psychology of Procedural Justice. New York: Plenum Press. McGinnis, M. D (2011). An Introduction to IAD and the Language of the Ostrom Workshop: A Simple Guide to a Complex Framework. Policy Studies Journal 39(1): 169–183. Moktan, M. R, Norbu, L, Nirola, H, Dukpa, K, Rai, T .B and Dorji, R (2008). Ecological and Social Aspects of Transhumant Herding in Bhutan. Mountain Research and Development 28(1): 41–48. Oliver, P and Jupp, V (2006). Purposive Sampling In: The SAGE Dictionary of Social Research Methods. : 244–245. London: Sage Publication Ltd.
Ostrom, E (1990). Governing the Commons: The Evolution of Institutions for Collective Action. Cambridge: Cambridge University Press. Ostrom, E (2008). The Challenge of Common-Pool Resources. Environment 50(4): 8–20. 10.3200/envt.50.4.8-21. Poteete, A. R and Ostrom, E (2004). In Pursuit of Comparable Concepts and Data about Collective Action. Agricultural Systems 82(3): 215–232. http://dx.doi.org/10.1016/j.agsy.2004.07.002. Quinn, C. H, Huby, M, Kiwasila, H and Lovett, J. C (2007). Design Principles and Common Pool Resource Management: An Institutional Approach to Evaluating Community Management in Semi-Arid Tanzania. Journal of Environmental Management 84(1): 100–113. Schlager, E and Ostrom, E (1992). Property-Rights Regimes and Natural Resources: A Conceptual Analysis. Land Economics 68(3): 249–262. Solomon, T. B, Snyman, H. A and Smit, G. N (2007). Cattle-Rangeland Management Practices and Perceptions of Pastoralists Towards Rangeland Degradation in the Borana Zone of Southern Ethiopia. Journal of Environmental Management 82(4): 481–494. Turkelboom, F and Wangchuk, T (2009). Steep Land Farmers and their Land Resources: A Holistic Land Degradation Assessment of Eastern Bhutan. Land Degradation Processes and Coping Strategies in Eastern Bhutan. Bhutan, C. f. R. R. o (ed. ), Wengkhar, Mongar: RNR RC, Wengkhar, Council for RNR Research of Bhutan, Ministry of Agriculture and Forests. Ura, K (2002). Herdmen’s Dilemma. Journal of Bhutan Studies 7: 1–43. Yin, R. K (2008). Case Study Research: Design and Methods. 5Thousand Oaks, California: Sage Publications.